If you are interested in sharing a room at the Renaissance Cleveland Hotel for the conference, contact Cher Smith to put your name on the list. You can access the list on the Members Only page of the PATH Intl. website. NOTE: PATH Intl. will not match up conference attendees but only supply the information. 2015 Conference Highlights - Don't Miss It! Whether you are an instructor wanting to improve your lessons, a director looking for ways to grow and sustain your center or a mental health professional ready to learn about equine-assisted activities and therapies, the PATH Intl. Conference has a session track to help you get the most out of your conference experience. Instructor Track: In Operation Mustang, Meggan Hill-McQueeney and Paddy McKevitt discuss how partnering with wild horses has proven life-changing and beneficial for the horses, veterans, volunteers and staff. Administration Track: Take away a plan for meeting your center's needs in Capacity Building: Growing Time, Treasure and Talent at Your Center with Dana Butler-Moburg. Equine-Facilitated Psychotherapy Track: Rough Ride: How to Reach Difficult Boys Through Horses with Christina Russell will give attendees strategies for understanding and working with at-risk boys. Other tracks include equine, equine-assisted learning, volunteer and participant tracks. But don't worry; you can mix and match as much as you would like -- but only if you register! for the 2015 PATH Intl. 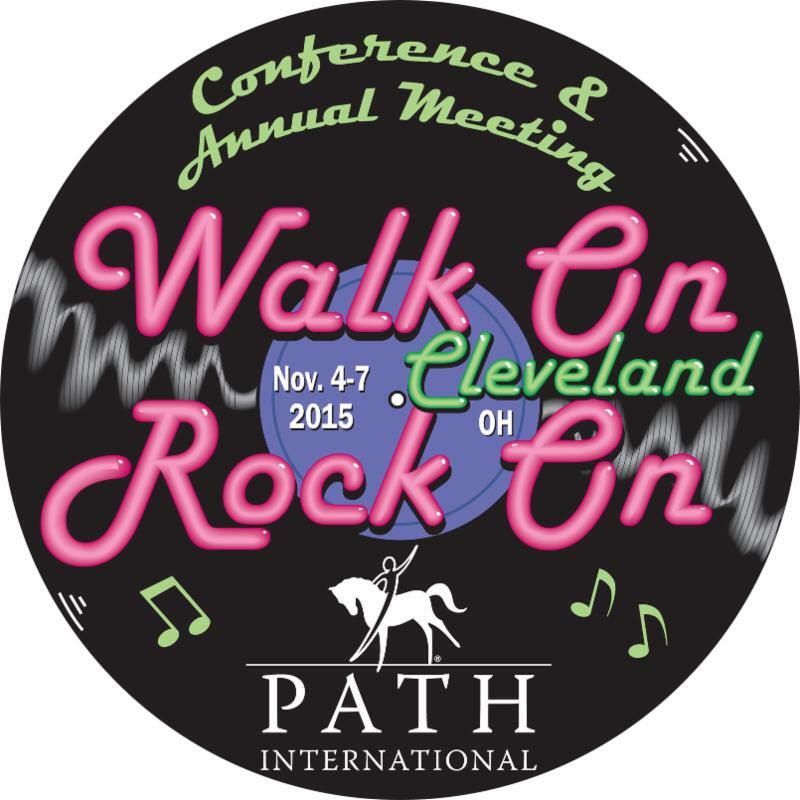 Conference and Annual Meeting, November 4-7 in Cleveland, OH, presented by title sponsor Purina. The deadline for early registration is September 17! The hard copy registration booklet and form was polybagged with the summer issue of PATH Intl. Strides or click the cover of the registration book (left) to open in your browser. PATH Intl. has received approval from NBCC (National Board for Certified Counselors). Eight sessions have been approved for CEs. The PATH Intl. Conference offers a plethora of opportunities to obtain instructor compliance CEUs. The conference program will delineate which sessions apply for the disability education core requirement and which sessions apply for general continuing education. Sessions fill up quickly, so register and pick your sessions as soon as possible. One of the world's largest indoor Ferris wheel's is located in the International Exposition (I-X) Center next to the Cleveland Hopkins International Airport. It is 125-feet tall and rises approximately 35 feet above the main roof. Have you ever thought, "I would like to pay for my membership online but I don't have a credit or debit card?" Now you can pay for your online purchases in the PATH Intl. store using the routing and account numbers on your check by selecting ACH as your payment method. We are now accepting volunteer applicants for the Riding Certification Subcommittee (RCSC). The RCSC is responsible for working with the PATH Intl. Certification Coordinator to review and develop all levels of riding certification materials, education, processes, and procedures in alignment with the PATH Intl. Strategic Plan. The RCSC also handles riding certification appeals and consults on candidate accommodation requests. Although the official start date of the term is January 1st, we will request your presence on the subcommittee calls as early as October for orientation purposes. If you are interested in applying, please submit your qualifications and a letter of intent to Jeff Kelling and Bret Maceyak by September 30, 2015. Join presenter Naomi Heller in this insightful new webinar to discuss the role of adaptive tack for mounted participants. Learn how and why to adapt tack, while considering the safety and comfort of the equine and participant, and acquire creative solutions to common adaptive tack questions. Click here to register. Please remember to update your mailing address and email in order to receive PATH Intl. news and membership cards. If your email address starts with info@, admin@, executivedirector@, etc., please change it to a non-role-specific email, such as an email address that uses your name. Role specific addresses are removed from our broadcast lists, and you will not receive information from us. Free email addresses, such as those provided by gmail or yahoo, are easy to set up. This assures Constant Contact, our broadcast delivery service, that we are not sending out spam and allows us to maintain our high reputation. Thank you! We are getting ready to begin a new veterans program at our center this fall here in Oklahoma and will be working with the local VA. Are any of you currently working with the VA and how does that partnership work for you? Do they just provide referrals or what other resources do they contribute to your program? Would love to hear what's working for you! Thanks! If you have any feedback for this member or would like to see the responses from other members, click here to see the post. Documentation of current Adult & Child CPR and First Aid certifications IS STILL REQUIRED to complete all PATH Intl. certifications. As a PATH Intl. certified professional, you are expected to maintain these certifications to uphold PATH Intl. safety standards and retain instructor compliance. Copies of these certifications may be requested at any time at the discretion of PATH Intl. Failure to supply documentation of current Adult & Child CPR and First Aid certifications in a timely manner will result in non-compliant instructor status. The PATH Intl. 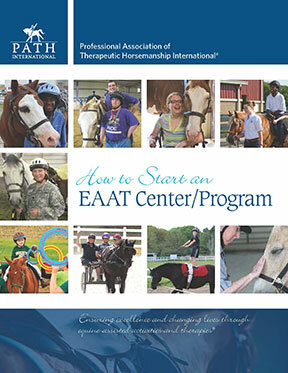 How to Start an EAAT Center/Program has been updated and is available in print or electronic download. It is a basic information source for those wishing to start an EAAT center/program. The new content delivers information on laying the proper foundation for center sustainability, which includes best business practices and industry standards. This packet includes practical advice, job descriptions, copies of the most recent PATH Intl. membership publications and other information readers will find practical and useful.